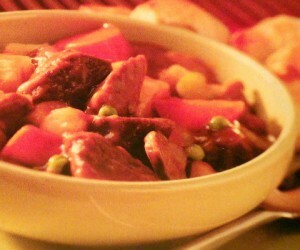 Adding apple cider and cinnamon gives a unique flavor to this economical and easy-to-make beef stew. 1. Place the vegetables, water chestnuts, mushrooms and onion in a 5-quart slow cooker. In a large resealable plastic bag, combine the gravy mix, soup mix, steak seasoning and cinnamon; add the beef, a few pieces at a time and shake to coat. Add to the slow cooker. 2. In a medium bowl, combine the broth, cider and tomato sauce; pour over the beef. Add the bay leaf; cover and cook on Low for 6 to 7 hours or until the beef is tender. 3. In a small bowl, combine the cornstarch and water until smooth; stir into the stew. Cover and cook on High for 15 minutes or until thickened. Discard the bay leaf before serving. Makes 8 to 10 servings. * You may substitute unsweetened apple juice for the apple cider if desired.